Music is very important to our resident Tianna, and she especially enjoys going to concerts to see her favorite bands perform. Tianna has developed a particularly nice relationship with her Direct Support Professional, Laila. 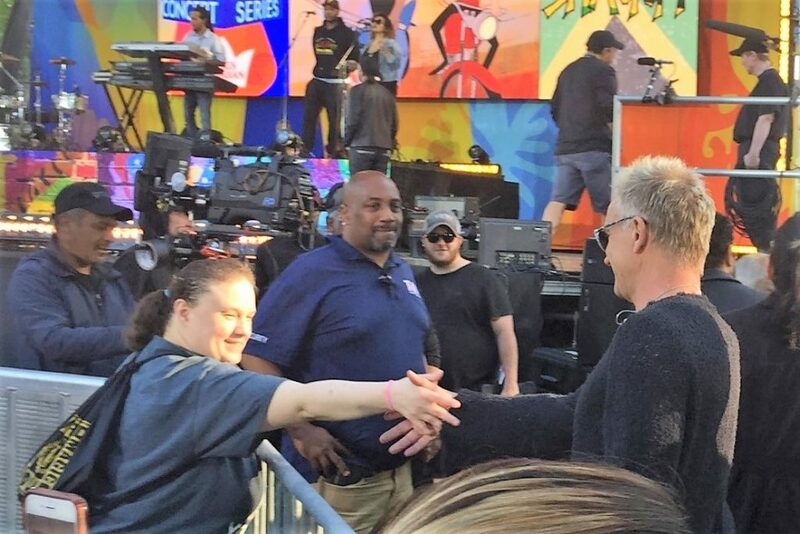 So, when Tianna expressed her desire to attend the morning concerts at the Good Day America show, she requested that Laila be the staff to accompany her. Laila gladly accepted the opportunity to go and, since May, they have already been to nine morning concerts together! Laila must come into work at 5am on the days of the concerts to ensure they get there on time. Tianna looks forward to concert days and she always comes home excited and eager to talk about how much fun she had. In the picture above, Tianna is shaking hands with Sting! Laila, thank you for your dedication to Tianna’s happiness, and for everything you do for our individuals at CFS!